Join a band of avian mobsters in GoodFeathers, a feature-packed 5 reel, 20 payline symbol drop video slot from Blueprint Gaming. It comes with the usual classy design as well as 3 base game modifiers and 5 bonus features. Play on all devices from 20p and £500 per spin. The design here is rather good. On the reels you’ll see a selection of weaponry and a flock of bird mobsters. The best of these is the Birdfather who offers payouts of up to 25 times your bet per payline. There’s also a wild that replaces all of the standard symbols and also pays up to 25 times your bet. Stork Wild feature – this adds a stacked wild. A new payout consideration then follows, complete with a new set of symbol cascades. Egg Bomb feature – a bomb explodes and a new set of symbols drop onto the reels. A symbol drop then takes place. These continue as long as a new winner appears. Fly By Wilds feature – a bird flies across the reels and fires a volley of bullets at the reels. All the symbols hit turn wild. A new payout consideration follows. If you land a win a symbol drop follows. GoodFeathers also comes with a series of bonus features. Fill the FBI Most Wanted Meter to the side of the reels by landing multiple cascade wins in a row to trigger the Briefing Room Bonus. Choose from the maps to reveal which of the 5 potential features you’ve won. If you don’t like your allocation, you’ll be offered the chance to gamble it for a better bonus. Prison Escape Bonus feature – this is a multi-stage pick me round. Setting birds free from jail awards cash prizes. The more of them you set free and the higher the levels you reach, the bigger the awards. Warehouse Bonus feature – this is a take it or leave it bonus. Pick a suitcase and you’ll be offered a cash award. You can accept it or gamble and hope to receive something better. ScarBird Free Spins feature – you’ll receive 5 free spins here with the ScarBird symbol creating bullet hole wilds. At the end of the round, pick a suitcase which could award another set of free spins. Infeathergation Free Spins – you’ll head to a new set of reels inside a police station where you’ll be awarded 8 free spins, complete with special wilds. At the end of these free spins, pick a card. Landing a Good Cop card awards a re-trigger. The Bad Cop card is a collect. Crime Scene Free Spins feature – 10 free spins are awarded if you land this round. Also in play is an expanding multiplier. There are 4 levels to work your way through here with multipliers that can reach up to 20x. Landing an FBI badge adds another 3 free spins to your total. Yes, it’s a bit silly but this avian take on Goodfellas is an entertaining one. It looks and sounds good and offers a massive range of extras. 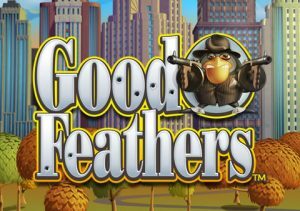 If you enjoy the mobster theme or just enjoy a video slot that delivers plenty of variety, then the GoodFeathers could make you an offer you can’t refuse. If you like the mobster theme, Chicago by Novomatic is decent. I also suggest you try other Blueprint Gaming titles with Grizzly Gold recommended.